Soltan Galib oglu Soltanli was born in 1976 in the family of teacher in Kalva village of Agsu region of Azerbaijan Republic. He began to paint in his childhood. In his adolescence the wish of being painter became much stronger. That is why in 1991 Soltan came to Baku to enter the former Azerbaijan State School of Arts named after Azim Azimzade, but he failed. Returning to the village and continuing his education there Soltan got attached to the painting very much, he increased his contacts with the nature and tried to feel the nature profoundly. Soltan's father was against to his son's wish. That is why Soltan painted his paintings secretly. He understood that not leaving the village he wouldn't reach his wishes. He had only a way to come to Baku in order get high education. He had also a great interest to the literature. So in 1993 Soltan entered the philology faculty of Azerbaijan State Pedagogical University and graduated it in 1997. During 1997-2000 years he got the magister degree according to the linguistics of that university. Coming to Baku Soltan got interested in painting very much, he went to the exhibitions and visited the famous painters' and sculptors' studios, wrote articles about them and always wanted to learn. His intention was decisive: to enter the School of Arts! Soltan had enough information about the art. He carried out the generalizations about the painters' activity and tried to explain works to himself. According to Soltan's thought the activity of all painters he had seen looked like to one another. But it gave anxiety to him: why were all painters' activities alike? In that case was it necessary to get the education of art?! 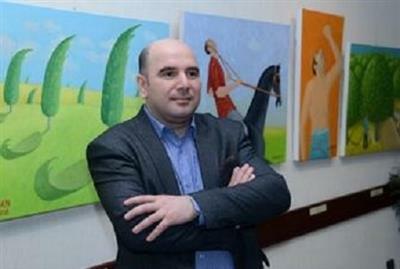 In 1995 in order to get the painting education Soltan went to the lectures at the former Azerbaijan State Art School named after Azim Azimzade and saw the deficiency of the traditional education for the activity in his dreams, then he decided not to get the painting education decisively. His goal was to become a different painter. Who and where would teach him that difference? That is why he preferred to study himself. So Soltan wanted to create his style. He wished to become a sensible and amazing painter sourcing from the deep layers of the human intellect, surrounding the philosophical, thinking and the eternal ideas. The question “How to become difference?” interested him very much. In order to get the answer of this question he began to read very much, studied Azerbaijan painting art and found the main point: in existing period Azerbaijan painting was deprived from the thinking, philosophy, the thought had no clear, correct, philosophical expression. 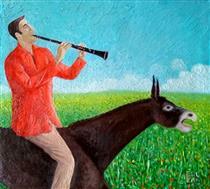 Azerbaijan literature and mugham having the great tradition is more philosophical than the Azerbaijan painting. It means one can create such philosophical thinking in painting. After all these Soltan came to the conclusion that painting was not only the description art, mainly, it was the art of thinking. The painter understood that when the art expressed the reality it was superficial and transitory. That is why the art must learn the eternal themes and create its everlasting maintenance. And this activity had to be far from the misunderstanding now addressed by many people. 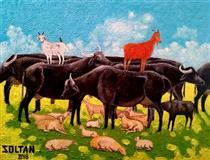 The paintings by Soltan are the mature examples of the modern art and painting. In these works one can see the deep theme layers. He tries to reveal the theme to the audience completely and considers it his duty. According to his thought if the work is not clear to the painter-creator then it is also not clear to the audience. In short, the painter not having the clear thought can't create the unquestionable work! The painter must paint the most philosophical work so easily that the audiences can understand it without difficulty. The intellect and philosophy are the main peculiarities for Soltan's activity. The painter not accepting any misunderstanding as “deep”, “philosophical” doesn't want to deceive the audience, he tries to enlarge the dream world of the humanity with his works and to show the essence of the real world. According to the painter’s thought each work is the explanation of something. That is why it is not necessary to explain the work, on condition that, the work to be painted clearly. 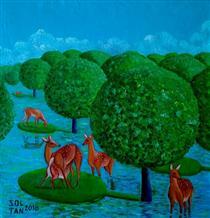 Soltan believes his fantasy and in his paintings creates the faith in the audience. These descriptions are unreal. That is why he names his works “irreal”. “Irreal” is unreal thing. But the unreal thing presented by the art is the real! But where can one see it? Only in the thought, thinking, dream, essence! It means the world doesn't consist of only reality; it also consists of the deep, philosophical unreality. So the main aim of the unrealism belonging to Soltan is the deep intellectual, philosophical, logical approach. According to Soltan’s thought the main demand of irrealism is to paint the unreality convincingly, logically, philosophically, clearly and simply. The art of painting should persuade people to the life, the future, not to create the terrible pessimism, the horrifying thoughts in them, and not to deprive the audience to the impatience, misunderstanding and depression. It is the main difference of the irrealism from the surrealism. Surrealism tells that the themes sourced from the sub-consciousness create the upper level of realism, but in order to simplify the difficulty, it makes much more difficult and puts the audience to the deepest impression. But irrealism does it on the contrary. It is sourced not from the subconscious, but from the high consciousness. Thus, it brings the human to the truth in a convincing way. According to Soltan’s thought, when the audience can’t understand the work they should not blame themselves and must not tell “May be I do not understand”. Because everything in the world is understandable. There is no inconceivable work for the audience in the painting, there is a work created by the intellectual incompetence of the author. From this point of view, irrealism imposes the serious demands in front of the author firstly, the artist brings the truth together with the audience, conveys it to the essence of the reality and opens the new opportunities for the thinking. Soltan is also a graphic and a caricaturist. Soltan has won prizes in many exhibitions and expositions, his works have taken part in many international catalogues. His works are kept in museums and private collections in different countries.